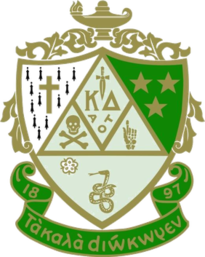 Ta Kala Diokomen "Let us strive for that which is honorable, beautiful and highest"
Kappa Delta (ΚΔ, also known as KD or Kaydee) was the first sorority founded at the State Female Normal School (now Longwood University), in Farmville, Virginia. Kappa Delta is one of the "Farmville Four" sororities founded at the university. (The others are Alpha Sigma Alpha, Sigma Sigma Sigma, and Zeta Tau Alpha; a clock tower at the university campus with a clock face representing each sorority is dedicated to the four). All of these sororities are members of the National Panhellenic Conference, which governs the 26 national social sororities. Kappa Delta has over 260,000 initiated members and 166 active collegiate chapters. Kappa Delta also has more than 200 chartered alumnae chapters. It is headquartered in Memphis, Tennessee. Lenora Ashmore Blackiston, Mary Sommerville Sparks Hendrick, Julia Tyler Gardiner Wilson and Sara Turner White founded Kappa Delta at the State Female Normal School (now Longwood University), in Farmville, Virginia. Blackiston first suggested forming a sorority. She went on to attend Randolph-Macon Woman’s College. At 23 years of age in 1897, Hendrick was the oldest founder and stayed at State Normal until 1902, longer than any of the other founders. Wilson was the chief illustrator of the school's yearbook and designed the Kappa Delta badge. White would frequently host Founders Day festivities at her home later in life. Kappa Delta Sorority's official philanthropies are the Girls Scouts of the USA and Prevent Child Abuse America. Kappa Delta's historical philanthropies are the Children's Hospital of Richmond at VCU and Orthopaedic Research Awards. Collegiate and alumnae chapters host confidence-building programs, educational events, campus tours and other activities with Girl Scouts in their communities. Sorority members serve as mentors and volunteers. Sorority members host Shamrock events every year to raise money for Prevent Child Abuse America and local child abuse prevention efforts. To date, Kappa Delta has donated more than $23 million to prevent child abuse in the USA. The official symbols of ΚΔ are the nautilus shell and the dagger, while the mascots are the teddy bear and the katydid. The official colors are olive green and pearl white. The official flower is the white rose. ΚΔ has 3 official jewels, the diamond, the emerald, and the pearl. Kappa Delta has 166 collegiate chapters across North America. In 2013 and 2014, sorority women from multiple chapters at the University of Alabama – including Kappa Delta, Alpha Gamma Delta, Alpha Omicron Pi, Phi Mu, Pi Beta Phi, Delta Delta Delta, and Chi Omega – alleged that either active members or some alumnae had prevented them from offering membership to black candidates because of their race. Students, including a Kappa Delta member, held a campus march to integrate Greek life on campus, and following media and national outcry, the university held a second round of recruitment in hopes of offering membership to more women. However, Kappa Delta was one of the few chapters on campus who had not recruited a single black woman by the next year. ^ a b c "History." History. N.p., n.d. Web. 03 November 2014. <http://www.kappadelta.org/history>. ^ "Genealogy of John Tyler and his Descendants". Retrieved October 21, 2014. ^ "Initiatives - Kappa Delta". Kappa Delta. Retrieved 2018-06-10. ^ "Kappa Delta Symbols." Kappa Delta Norman Shield. Memphis: Kappa Delta Sorority, 2013. 28. Web. 03 November 2014. ^ "Collegiate Chapter Directory". Kappadelta.org. Retrieved 2014-08-21. ^ "Notable KDs - Kappa Delta". Kappa Delta. Retrieved 2017-03-23. ^ "Notable Kappa Deltas - Pearl Sydenstricker Buck". Kappa Delta. Archived from the original on 2009-02-19. Retrieved 2007-07-25. ^ "Notable Kappa Deltas - Jean Carpenter Carnahan". Kappa Delta. Archived from the original on 2009-02-19. Retrieved 2007-07-25. ^ "Meet Miss Alabama". Miss Alabama. 2009. Archived from the original on 2010-04-15. Retrieved 2010-04-17. ^ "Board & Advisors". Grandma's Gifts. Archived from the original on 2009-05-05. Retrieved 2009-05-06. ^ "Notable Kappa Deltas - Ellen Albertini Dow". Kappa Delta. Archived from the original on 2009-02-19. Retrieved 2007-07-25. ^ "Notable Kappa Deltas - Bonnie Dunbar". Kappa Delta. Archived from the original on 2009-02-19. Retrieved 2007-07-25. ^ Thomas, Ralph. "Gubernatorial candidate Gregoire faced racial dilemma in college". Seattle Times. Retrieved 2008-07-07. ^ "Notable Kappa Deltas - Claudia Kennedy". Kappa Delta. Archived from the original on 2009-02-19. Retrieved 2007-07-25. ^ "Notable Kappa Deltas - Ali Landry". Kappa Delta. Archived from the original on 2009-02-19. Retrieved 2007-07-25. ^ "Miss Arkansas 2015 Loren McDaniel - Miss America". Miss America. Retrieved 2017-03-23. ^ "Notable KDs". Kappa Delta. Retrieved 2019-03-22. ^ "Cara Mund". Linkedin.com. Retrieved September 14, 2017. ^ Moniuszko, Sara M. (September 10, 2017). "Miss America 2018: Miss North Dakota Cara Mund takes the crown". USA TODAY. ^ "Notable Kappa Deltas - Joan Lowery Nixon". Kappa Delta. Archived from the original on 2009-02-19. Retrieved 2007-07-25. ^ "Notable Kappa Deltas - Georgia O'Keeffe". Kappa Delta. Archived from the original on 2009-02-19. Retrieved 2007-07-25. ^ "Meet Miss Florida". Miss Florida. 2009. Archived from the original on 2010-03-23. Retrieved 2010-04-17. ^ "The Blind Side (2009)". Internet Movie Database. April 22, 2009. Retrieved 2013-04-20. ^ "The Blind Side (2009)". Rotten Tomatoes. IGN Entertainment. Retrieved 2013-04-20. ^ "Meet Miss Trinidad". Miss Trinidad. 2014. Archived from the original on 2015-03-17. Retrieved 2015-03-15. ^ "Notable Kappa Deltas - Debbie Maffett Wilson". Kappa Delta. Archived from the original on 2009-02-19. Retrieved 2007-07-25. ^ "Notable Kappa Deltas - Trischa Zorn". Kappa Delta. Archived from the original on 2009-02-19. Retrieved 2007-07-25.